So, a funny thing happens when you post about Spring (Spring!!). Mother Nature decides it would be suuuuper funny to dump massive quantities of snow all over your proceedings. Um, yeah. Like A LOT of snow. The day after I pushed "publish" we were treated to a snowstorm of (for the Pacific Northwest anyway) epic proportions. For four days I didn't go anywhere and nobody came here. Which was kind of awesome because it meant that I could tear my whole house apart! Ha! I've had some bigger furniture swapping projects that I've been avoiding because it would mean major chaos fallout for a few days while I put things back together. You know the kind of project I mean? Where you are playing musical furniture between four different rooms and everything in those four rooms has to be dumped on the nearest available surfaces or crammed in boxes so you can just get the pieces moved around? And then you're left with an entirely wrecked house? Yep, one of those projects. We swapped my closet dresser for a smaller one, switched the nightstands for taller ones, moved our bed to the proper center of the wall, put the vintage dressers that used to be on either side of the bed in my living room/sewing room, put the wingback chairs in there so I could have a full sitting area for stitching with friends, made room for that by moving the grain-sack table onto the back wall, and made room for that by moving the big carved buffet (now painted) AND my workspace into the bonus room where the office is (where I'm sharing with Mr. Magpie, which is actually working beautifully), and made room for THAT by moving the vintage oak desk into the mudroom temporarily. You know, the (someday) mudroom. The area full of junk. How did we fit the desk in there? I emptied it. YES. EMPTIED. I'm feeling like a purging Ninja right now, let me tell you. And here's the best part. After the big big move was done, and there was stuff, just, EVERYWHERE, I decided to take a break and do something nice for myself. I finally got out some of the thrifted art I had collected and hung it on the wall. I took my time, hanging up one thing, seeing how it felt, adjusting, hanging more. It took forever, but it was a really satisfying process and one that made me feel, finally, like this space is something that reflects me, that makes me happy, that makes me want to spend time in here, both alone and with my friends. 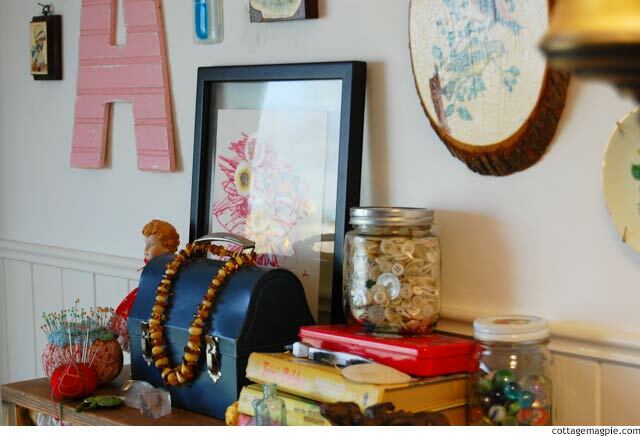 The bits and pieces on the wall are a mash-up of things I've collected, things I've made, things others have made for me and things I've been given. For me, it emanates love and creativity and hopefulness and all the best wishes of people who have given me the gift of their love. It's a great thing to have in a space I create in. OH yes, and remember that pretty hanging lamp from the dining room that had it's shade broken? Well, it's in there, too, with a new, smaller milk-glass shade that Mr. Magpie found at the ReStore and it's plugged in to the outlet that connects to the light switch! I mean, people, happiness AND functionality? I feel blessed, truly blessed beyond measure. Every time I see this space now it just fills up my heart. I highly recommend it. 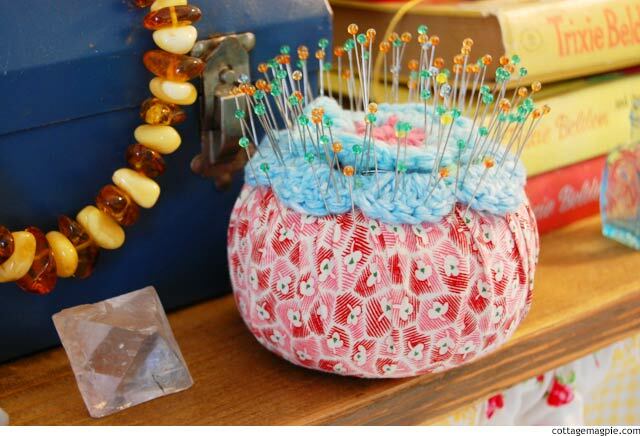 I even took a moment to recover my old tomato pincushion with some cute fabric. I just pinned it down, and covered the top with a crocheted flower. The pattern is the center part of a crocheted flower square from the very, very talented Beata of Rose Hip. Really, go there and daydream with all the loveliness!! I am determined to fit entirely in this space, too, with no overflow. I still have quite a ways to go, but it feel so good to be getting closer. Every day I give a little more away, finish a little more on backlogged projects, whittle away a little more of the pile (hidden behind one of the chairs), and I can envision the day that I can say that 100% of my sewing projects and supplies are in this room. Comfortably in this room. That day is coming soon and it I will be so happy. Meanwhile, back to the boxes!! I have shared all this happiness, but not yet 'fessed up about the huge, mammoth, gargantuan pile of boxes in the bonus room closets. You know, the double closets in the bonus room? Yep, they are full. COMPLETELY full of boxes of junk that I need to sort out and clear out. But just when I thought I couldn't purge one. more. single. thing, my friend Emily from Pioneer Perfume recommended a book that has added rocket fuel to my process. Seriously, changed my entire outlook on my possessions and my life. It's called Clearing Your Clutter with Feng Shui by Karen Kingston, and you can probably get it from your library. Do not wait, do not pass go!! Or if you want to buy a copy, you can get it from Amazon.com here: Clear Your Clutter with Feng Shui: Free Yourself from Physical, Mental, Emotional, and Spiritual Clutter Forever*. So. Boxes: ready! Breath: in! Loins: girded! GO! How about you? Are you doing the Spring Fling thing? How's it going? Any stuck places? Any great tricks?? *The Amazon.com link is an affiliate link, which means I will earn a few cents if you buy the book from that link. But don't feel obligated!! Get the book at your library or search for it directly at your bookstore of choice!! Sharing at Fine Craft Guild and Mod Vintage Life.